Looking for deals in New Orleans? Located 1 mile from the New Orleans French Quarter, this hotel features an outdoor swimming pool and a whirlpool. Free Wi-Fi is also included. Very friendly staff! We liked the free hot breakfast and the afternoon free wine/beer with hot meal snacks (served from 5:30pm to 7:00pm). We also found the rooms to be quite from outside noise. Featuring an on-site restaurant and outdoor pool, Bourbon Orleans Hotel offers accommodations in the French Quarter within walking distance to the Louisiana State Museum, St. Beyond our expectations , front desk agents were amazing and helpfull at all times. Featuring a private courtyard and close proximity to Bourbon Street, Hotel Mazarin is located in New Orleans' French Quarter and offers complimentary breakfast and a welcome drink at the hotel bar. This is the third time we have gone to New Orleans and have always stayed here. The first time we also stayed at another hotel for one night. Why ruin a good thing? Located right off of Canal Street and adjacent to Tulane School of Medicine, The Jung Hotel and Residences offers modern rooms within less than 0.6 mi from Mercedes-Benz Superdome. The hotel staff was extremely helpful and friendly.They helped us booking daily tours and gave us many recommendations.The room was so neat , nicely decorated. The bed was super comfortable.They cleaned the room ever day and left fresh towels. There was complementary water, tea and coffee in the room.The location was perfect. We could walk to the French Quarter. It couldn't be better. I would definitely go back! Located in New Orleans Central Business District and within walking distance of Bourbon Street, The Saint Hotel, Autograph Collection offers luxury accommodations in close proximity to the Canal... Hotel decor is really nice, designer-like. Just 2 blocks from the French Quarter, this hotel offers accommodations in a restored 19th century building. It offers an on-site bar and rooms with free WiFi and a flat-screen TV. The Eliza Jane is one of the finest, small hotels I have ever been in my life. Across the street from the Morial Convention Center in New Orleans, this fully non-smoking hotel provides guest rooms, suites and studios along with convenient amenities just 8 blocks from the French... Good variety for breakfast. Thank you. Located in the Uptown district in New Orleans, Park View Historic Hotel offers 4-star rooms with free WiFi. With a garden, the property also features a terrace. I loved the feel of the old world charm of this hotel (Bed & Breakfast). In a restored 1884 Victorian mansion, the Melrose Mansion is in New Orleans' celebrated French Quarter on the historic Esplanade Avenue. Beautiful property. Room was clean and comfortable. Great breakfast. Friendly staff. New Orleans’ bustling Bourbon Street is about half a mile from the Hotel Villa Convento. Free Wi-Fi access and balcony views are available on each floor of this hotel. Warren was an extremely friendly and helpful host. This New Orleans hotel is just off I-10 and is a 15 minute drive from downtown New Orleans. It features an outdoor pool, a hot tub, and a fitness center. The property was clean and the staff was great. This historic New Orleans hotel features modern conveniences in a nineteenth-century town home within walking distance of Bourbon Street. The Grenoble House is the perfect place to stay. Just a half-block from Canal Street, this 5-star New Orleans hotel is a 5-minute drive from the French Quarter. I really enjoyed my stay. Very convenient location, very friendly and helpful employees, great room. Featuring free WiFi and a restaurant, NOPSI Hotel, New Orleans offers pet-friendly accommodations within walking distance of the French Quarter in New Orleans. Excellent Hotel , the staff were amazing and the room was spotless. Featuring free WiFi and a fitness center, Aloft New Orleans Downtown offers pet-friendly accommodations in New Orleans, 2297 feet from Bourbon Street. Guests can enjoy the on-site bar. I recently as well 5/14-5/16 I was stayed here, I want to say that it’s an excellent hotel. How much does it cost to stay in a hotel in New Orleans? On average, 3-star hotels in New Orleans cost $172 per night, and 4-star hotels in New Orleans are $206 per night. If you're looking for something really special, a 5-star hotel in New Orleans can be found for $371 per night, on average (based on Booking.com prices). The average price per night for a 3-star hotel in New Orleans this weekend is $626 or, for a 4-star hotel, $762. Looking for something even fancier? 5-star hotels in New Orleans for this weekend cost around $909 per night, on average (based on Booking.com prices). Which hotels in New Orleans are good for families? Many families visiting New Orleans loved staying at Hotel Peter and Paul, Domio Baronne St., and Grenoble House. On average, it costs $178 per night to book a 3-star hotel in New Orleans for tonight. You'll pay around $222 if you choose to stay in a 4-star hotel tonight, while a 5-star hotel in New Orleans will cost around $390, on average (based on Booking.com prices). Which hotels in New Orleans are good for couples? 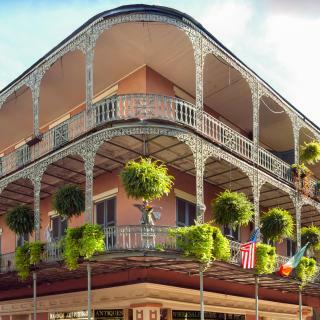 These hotels in New Orleans are highly rated by couples: Grenoble House, The Jung Hotel and Residences, and Homewood Suites By Hilton New Orleans French Quarter. What are the best hotels in New Orleans near Bourbon Street? Some of the best hotels in New Orleans near Bourbon Street include Grenoble House, Hotel Le Marais and Homewood Suites By Hilton New Orleans French Quarter. Which hotels are the best ones to stay at in New Orleans? Drury Inn & Suites New Orleans, Hotel Mazarin, and Bourbon Orleans Hotel are some of the popular hotels in New Orleans. Which hotels in New Orleans have nice views? Park View Historic Hotel, Loews New Orleans Hotel, and TownePlace Suites by Marriott New Orleans Downtown/Canal Street got great room view-related reviews from travelers in New Orleans. 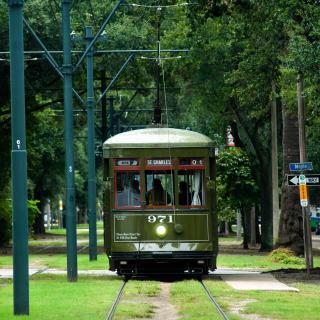 Which neighborhood is the best one to stay at in New Orleans? French Quarter (Vieux Carré), Downtown New Orleans, and Garden District are popular with other travelers visiting New Orleans. What are the best hotels in New Orleans near Louis Armstrong New Orleans International Airport? Travelers who stayed in New Orleans near Louis Armstrong New Orleans International Airport (MSY) have said good things about Days Inn by Wyndham New Orleans Airport, Hilton New Orleans Airport, and Holiday Inn - New Orleans Airport North. Which hotels in New Orleans offer an especially good breakfast? For hotels in New Orleans that serve highly-rated breakfasts, try TownePlace Suites by Marriott New Orleans Downtown/Canal Street, The Saint Hotel, Autograph Collection, and Hotel Mazarin. 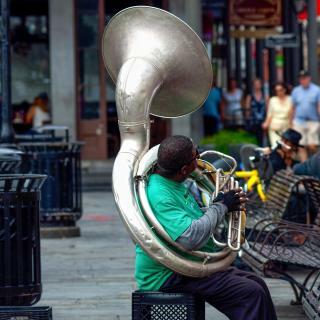 The home of jazz, intriguing New Orleans evokes images of Louis Armstrong, wrought-iron balconies and mouth-watering Cajun cuisine. 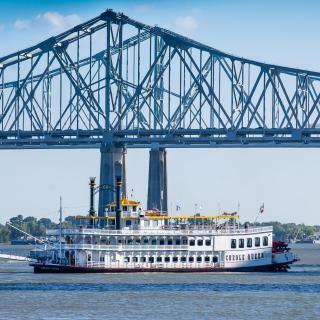 Louisiana’s largest city, the Big Easy is the beating heart of the Deep South. Dance down Bourbon Street, where jazz saxophones ring out of traditional bars mixed with more colorful nightlife and entertainment venues. There are several New Orleans hotels near Bourbon Street, spread around the French Quarter with its distinctive Creole architecture. To the south is Jackson Square, dominated by St. Louis Cathedral. Horses and carts wait patiently by the square, and locals set up their stools and start playing catchy tunes. Just behind is the legendary Mississippi River whose waters are still plied by paddle steamers. From the river you get great views of the CBD (downtown) skyscrapers and the Louisiana Superdome. Booking.com has several hotels nearby, including some on Canal Street, where streetcars and the famous New Orleans Mardi Gras carnival pass down. 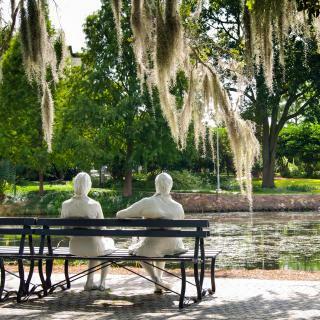 In the northern suburbs is New Orleans City Park, one of the oldest US parks and larger than NYC’s Central Park. Waterways lining it flow into large Lake Pontchartrain bordered by a bayou. 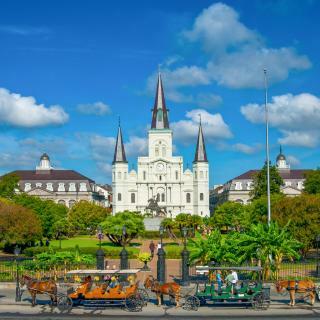 It’s the Big Easy - the locals are laidback and visitors are here to have fun.. We like Acme Oyster Bar and loved all the food booths in Jackson Square. There was music everywhere- the best was a street band led by a fantastic trumpet player. We got around the city with Uber, pedicabs and walking. Shopping was fun in the French Market and on Magazine St.
We happened to be staying in NOLA during the French Quarter Festival, which we had no idea was going on when we booked this. It made the charm and appeal of the city come truly alive with a wonderful love of jazz music wafting through the air all around you. The crawfish boilers were not our thing to smell, but again added to the local flavor of the Creole heritage there. People were super friendly and you can get a drink anytime, anywhere in this city....enjoy the atmosphere of The Big Easy! The first thing we did was spend a morning at the WWII Museum. It is huge so we didn't see everything, but it is well organized to handle the large crowds. The film was excellent; prices reasonable for military families. We took the paddle boat trip to the site of the Battle of New Orleans. There was a historian who narrated the historical events, but it was difficult to hear him because many people were talking and not listening. 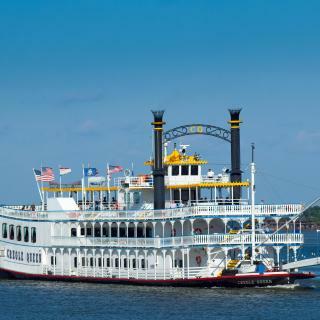 But a trip on the Mississippi is not to be missed and there is a choice of tours. We had a wonderful dinner at the Restaurant August, which had been recommended by a friend. It was wonderful, an elegant old house with crystal chandeliers; attentive service; delicious food. We also ate oysters, raw on the half-shell and grilled, at several different restaurants: mmm! We used taxis and a Pedi-Cab because we are an elderly couple but rode a trolley car once and the public transportation system in the city is excellent. LOVE NOLA charm, history and fun. LOVE NOLA charm, history and fun. Music is the background of every corner while strolling through the mysteries of the French Quarter. Delish food, drinks and welcoming locals. Zoo and aquarium are a must for kiddos and animal lovers. Magazine Street strolling is a must for boutique shoppers and foodies. So much to explore in this wonderful City. We visit there often and enjoy the local people that we have met. We enjoy shopping in the quarter and dining in the area. It’s always a lively adventure. The zoo and aquarium are amazing and you must experience the beignets at the Cafe du Monde. I’m excited I finally got here. I’m excited I finally got here. It’s not what I expected but all in all so glad I came here. It’s pretty dirty. A lot of devastation but not from the hurricanes. There are a lot of homeless people, a lot of people peeing and pooping on the streets. Garage everywhere. But the history we received after going on a carriage ride and on the paddle boat was out of this world amazing. The music on every corner was wonderful. Don’t be surprised when you see a 4 year old with a five gallon pail and some sticks playing for some cash. But totally worth it because the talent is amazing. The location of this beautiful B&B is absolutely perfect—literally steps away from the cool music scene on Frenchmen Street and at the north end of the French Quarter. We even caught a parade going right by the house, with the best view ever from the front steps. The house itself is amazing and the rooms gorgeous and comfy. Emily is a perfect host, making everything so easy—very thoughtful and friendly, and a true New Orleans fan and aficionado. Our stay was incredibly fun and memorable. We highly recommend this great place! The staff at this hotel are amazing. Everyone was so friendly and we were made to feel welcome at every moment. The hotel itself is really quirky and the decor really added to our New Orleans experience. It's a 10 minute walk to the French Quarter which was great for us as it was quiet when it was time to sleep. We are two women travelling and felt completely safe walking back to the hotel of a night time. If we ever visit again we will definitely stay here. I highly recommend it. The rooms were beautifully appointed, and perfectly clean. The atmosphere was completely representative of the idyllic beauty in the New Orleans French Quarter. Great location to Jackson Square, the French Market, and Bourbon Street without being surrounded by too many rowdy tourists. This was a great value! We are frequent travelers to New Orleans (once every month or every other month) and I think I found a new favorite hotel! It’s definitely “the place to be” with an astounding terrace bar, great coffee shop (Stumptown) and some of the best food close by! The rooms are clean, modern and comfortable and I loved the location! It’s close to the French Quarter, the Water walk and the National World War II Museum but exactly far away from the craziness to feel like your are coming home after a fantastic day in New Orleans! Highly recommend it! Comfortable and clean with a great bedroom and bathroom. The staff are beyond friendly and welcoming as are all the locals I've met here in new orleans. The hotel has great facilities from laundry to a pool and breakfast. Location wise, it's about a 5 minute walk to canal street and a further 10 minutes on top of that to the french quarter. We love this hotel, it's a nice building, very clean and the staff is very kind. The position is perfect: literally 5 minutes (walking distance) from the French Quarter. Breakfast was satisfying. Our room was small, but clean and fully renovated. Really comfortable! We liked it! Next time in New Orleans, for sure we will stay again here! I loved the history and warmth of the HH Whitney B&B. Glen and staff were awesome and very welcoming. The walk to The French Quarters was a nice stroll and very scenic. It was better than staying at a hotel and very comfortable. The New Orleans experience was as great as my stay at this B&B. We will be going back for another stay. The breakfast was excellent. The area of the hotel is the nicest of New Orleans. Wonderful mansions in the neighborhood. Safe and clean. The innkeepers are extremely friendly. Despite our disappointment with the French Quarter we would come back immediately due to the wonderful hotel and the nice area surrounding the hotel. It's New Orleans...what's not to like.? The 4 Points hotel is in an excellent location, the hotel food, staff and accommodations are also among the best I've encountered in my many travels. Clean, comfortable beds and room and a great view on the 2nd floor balcony. Truly a gem within the French Quarter. I came to New Orleans to take part in the Halloween festivities and this was the perfect hotel. Locedted directly off Bourbon I was seconds from the center of the section and everything else in the French Quarter. Free breakfast was available which was warm,free drink tickets, a gym and a small plunge pool. What a great place to stay in the French quarter in New Orleans, from our balcony we could see the Mississippi River and within 5 minutes you’re on Bourbon street and the hop on hop off busses. They serve a nice breakfast and our room was beautiful! The room we were given was larger than expected, comfy beds, beautiful surrounds (very tranquil), lovely staff, beautiful breakfast. 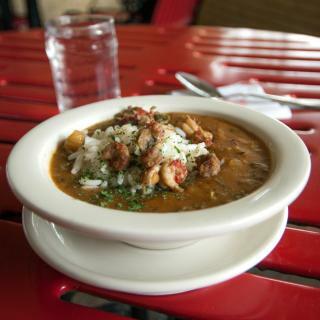 Only a short Uber ride away from the French quarter. Would recommend this place to anyone staying in New Orleans. We were immediately surprised by the proximity to both the French quarter and Garden District. Walking distance to Bourbon Street. The hotel itself was perfect! Beautiful, immaculate, easy to access. We will be staying there from now on. Everything was really beautiful. Nice location I can and will recommend. Friendly and helpful staff, clean rooms and perfect atmosphere in the hard of French Quarter. One of the oldest buildings in New Orleans. Thanks guys. A really lovely hotel. The rooms were clean, the bed was comfortable and the room was really nicely decorated. The staff were friendly and courteous. The hotel is ideally situated within the French Quarter of New Orleans. Overall the hotel isn't bad.. you're in a great location in the French quarters.. one block from bourbon street.. walking distance from all there is to see in new orleans.. The kitchen was the best thing in the apartment also location was excellent about a 7min drive from downtown new Orleans,bourbon street and French quarter. Excellent location in the French Quarter, iconic New Orleans hotel. Friendly and helpful staff. Hotel was beautiful and well kept with gorgeous live flowers throughout. The bars were lively and a nice respite from the noise and heat on the street. Staff was courteous and helpful. Room was clean and quiet although the view was lacking. Pool and pool bar was excellent!